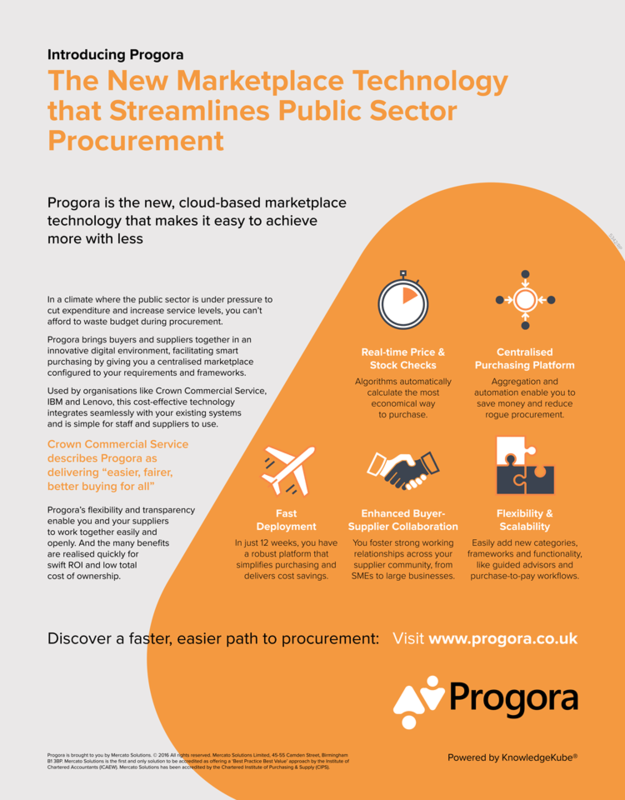 Software development company Mercato approach us for help in launching a new product: Progora is a digital purchasing platform for the procurement team, aimed primarily at the public sector. The innovative technology holds approved suppliers, enabling organisations to create their own marketplaces for buying products and services. We were tasked with creating a detailed advertisement for publication in The Times’ Racounter supplement, with the additional challenge of a short turnaround time. Our first step was to hold a fact-finding session with the sales team to pin down the messaging for the advert. From this, it soon became apparent that the material that the Mercato team had produced to date was too focused on the technicalities of the product. In view of the plethora of innovative features the platform delivered, the team were finding it challenging to break away from this approach. Our customer-centric approach enabled us to home in on the end benefits for public sector procurement professionals. Focusing on the target audience’s central pain point – the overriding pressure to cut expenditure and increase service levels – we were able to create an advert that pointed to Progora as the solution to this problem. In contrast to previous copy, the advert we created focused clearly on benefits to the end user, and the Mercato team was delighted by this fresh approach. Subsequent to publication of the advertisement, we’ve continued working with Mercato, both for Progora and other strands of the business. So well done and thank you – I think in such a short time working on this, we are already making a huge impact.